Glenn Hegar, the state's comptroller of public accounts, is warning lawmakers that Texas' bond ratings are at risk because of a couple of pending expensive problems. That's just the tip of the iceberg. Texas policymakers have a serious math problem. In just the first two days of the week, state legislators heard from Texas Comptroller Glenn Hegar that pensions and other expensive issues have attracted the attention of the nation’s bond rating agencies, and a specially assembled committee took in the latest chapter of the state’s persistent school finance troubles. Come January, those pricey problems will confront a Legislature elected by voters who are both price-sensitive and product-sensitive — people who want lower taxes but also better schools and roads and all that other stuff they’ve asked government to handle. It’s not like Texas is facing hard economic times. But the gains in state economic activity are being gobbled up by the Legislature’s chronic tendency to write its fiscal policy for the moment — and not for the tomorrows and the days after tomorrows that lie ahead. 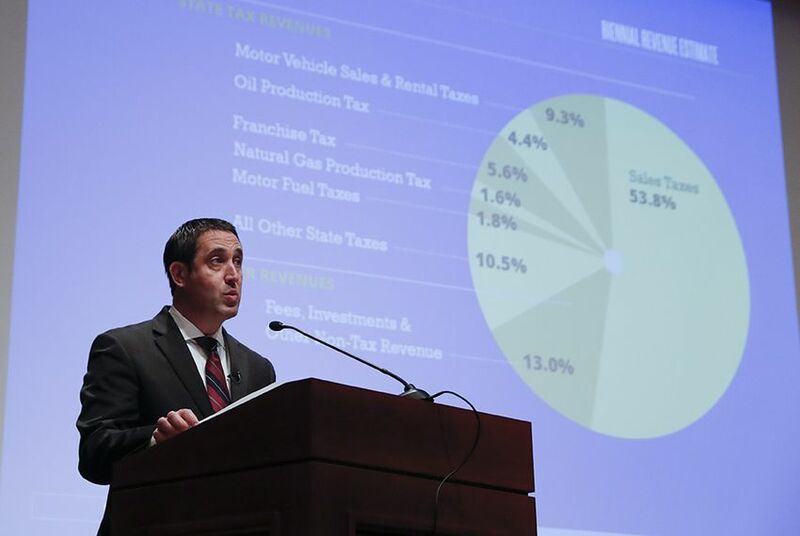 Before Hegar brought his crystal ball to the Capitol, the Legislature was already staring at forecasts of tight budgets ahead. The Texas Taxpayers and Research Association shared a so-far undisputed look last year, saying lawmakers would start the next budget almost $8 billion short of what’s needed to continue current programs, services and policies. Sure, there’s more money coming in. But lawmakers already know they’ll need another $2 billion to pay for the Medicaid program in the current budget. A $3.6 billion sales tax deferral for roads and highways has to be made up. It goes on like that, ending with a prediction that the Legislature will have a $7.9 billion hill to climb — all that before you consider Hegar’s comments and the costs of Hurricane Harvey and solutions to the current school finance conundrum. The aptly named Texas Tomorrow Fund is part of the problem, and has been for more than a decade. The original idea was simple enough: Pre-pay college tuition and lock in the cost of tuition and fees at a state college or university when the student in question is ready to go. The prices turned out to be low, especially after the state put a constitutional guarantee behind the fund and then legislators gave their tuition-setting powers to the schools themselves. It turns out that the schools raise tuition slower than the Legislature itself. Even so, Hegar told the Senate Finance Committee on Tuesday that the difference between the state’s Tomorrow Fund obligations and the amount it charged for them is around $240 million. You can’t blame most of the state government’s current seat-warmers for the problem; enrollment was shut off in 2003, as rates were deregulated. But you can blame every budget-writer from then to now for not setting aside money to cover the gap, which is measured every year by actuaries. It’s not like this was uncharted territory. The biggest financial drag on Hegar’s list of fearsome beasties is the Teacher Retirement System, which is gigantic, covers a large number of retired people and a lot of people who hope to retire someday on what’s been promised to them. It’s the TRS obligations that Hegar wanted to tell the senators about, the dent in the state budget that has the attention, he said, of the agencies that rate bonds and, by so doing, determine how much the state has to pay when it borrows. Lower ratings mean more expensive debt. Texas has the highest rating; any change at all means its cost of borrowing will rise. Pull school finance onto this already messy plate. On Monday, the state’s newest special committee on school finance met to hear public testimony. It’s a decades-long conversation over how much it costs to educate the state’s children, how to collect the money needed and how to distribute that money to the schools. If you think public education in Texas has all the money it needs — some do, some don’t — there’s still the question of where it ought to come from. The state’s share of the load has dropped significantly over the last decade. The local share is up. Property taxes, which fund the local share, are one of the prickliest objects in Texas politics today. They’re high, people don’t like it, and they’re telling their somewhat responsive elected officials to fix it. In the broadest terms, that means cutting education spending, increasing state spending, lowering local spending, or some combination of the three. It’s a budget problem wrapped in an education problem wrapped in a tax problem. Don’t forget Harvey, the monster storm that walloped the Texas Gulf Coast last year and left a long, long to-do list of repairs and replacements and policy problems ranging from housing to health care to infrastructure to local zoning to energy. There’s more to that list, and the list is going to have a significant price tag. The arithmetic is ugly. Bond ratings could be the least of the state’s worries. Disclosure: Texas Taxpayers and Research Association has been a financial supporter of The Texas Tribune, a nonprofit, nonpartisan news organization that is funded in part by donations from members, foundations and corporate sponsors. Financial supporters play no role in the Tribune's journalism. Find a complete list of them here.